The country’s two key trade bodies yesterday demanded the central bank bring down the interest rate on lending to single-digit with a view to enabling businesses to flourish. The call came from the Federation of Bangladesh Chambers of Commerce and Industry (FBCCI) and the Dhaka Chamber of Commerce and Industry (DCCI) in two separate events. The high non-performing loan (NPL) ratio has raised the interest rate by 1 percentage point, said Osama Taseer, the newly elected president of the DCCI, at a press conference at the chamber’s office in the capital. As of September last year, the total NPL in the banking sector stood at Tk 99,370.92 crore, which is 11.45 percent of total outstanding loans — the highest in Bangladesh’s history. “The banks do not want to reduce the interest rate to single-digit giving the excuse of higher NPL,” Taseer said, adding that the lenders are not following the government instruction of bringing down the interest rate to single-digit. The central bank should take immediate measures to reduce the mounting NPLs, said FBCCI President Md Shafiul Islam Mohiuddin in a meeting with Bangladesh Bank Governor Fazle Kabir. “This will ultimately help lower the interest rate on lending,” he said, while urging the central bank to compel lenders to follow their earlier commitment to keep the interest rate on lending at 9 percent. Mohiuddin also requested the BB governor to help the businesspeople who have become defaulters for incurring losses. “Not everyone is a willful defaulter. Many became defaulters while running their business as they could not make profit,” Taseer said. Industrial loans account for 44 percent of the total default loans, raising serious concerns about the quality of loans being disbursed. “The default loans must be recovered but the government should not bring down the amount through write-offs,” the DCCI president said. The central bank should take initiatives to bring the willful defaulters to book in the interest of corporate governance in the banking sector, Mohiuddin said. “We have urged the central bank to form a working group to address the issue. In response, the BB governor assured us of including representatives from the business community, among others, in the group,” he told The Daily Star after the meeting at the BB headquarters. SK Sur Chowdhury, banking reform adviser to the central bank, told The Daily Star that the central bank had agreed in principle to form the committee. He, however, said there was no scope to fix the interest rate in an open economy. The central bank is still monitoring the interest rate on both lending and deposits set by the lenders so that they cannot breach their declared rate, Chowdhury added. The FBCCI also demanded easing of the policies for loan classification and provisioning. 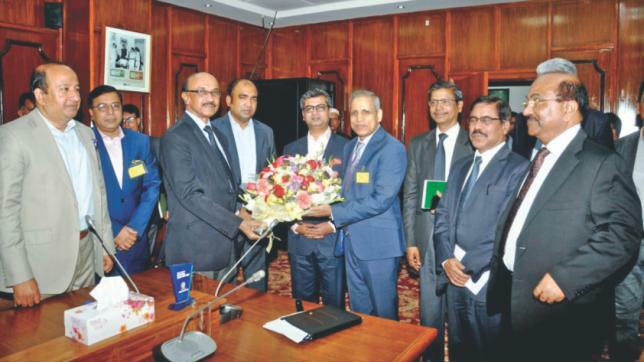 SM Moniruzzaman and Ahmed Jamal, deputy governors of the central bank, FBCCI Senior Vice President Sheikh Fazle Fahim and Vice President Md Muntakim Ashraf were present at the meeting.